An innovative mixed media installation, musaj te dzav (we are leaving), and photographs of Toronto Roma, romarisingCA , open Toronto’s festival of Romani arts and culture, Opre Roma/Rise Up Roma. The exhibition opens Wednesday, April 8, 7:30-10 pm at Gallery 50, 50 Gladstone Avenue. Guitarist Jozsef Botos will provide musical accompaniment, and wine and cheese will be served. Remarks and artists’ Q & A begin at 8 p.m. Produced by chirikli collective, the exhibition musaj te dzav by Monica Bodirsky, Riel Brown, Lynn Hutchinson Lee and Hedina Sijercic, is based on the historical migration of the Romani people with its endpoint in Canada. 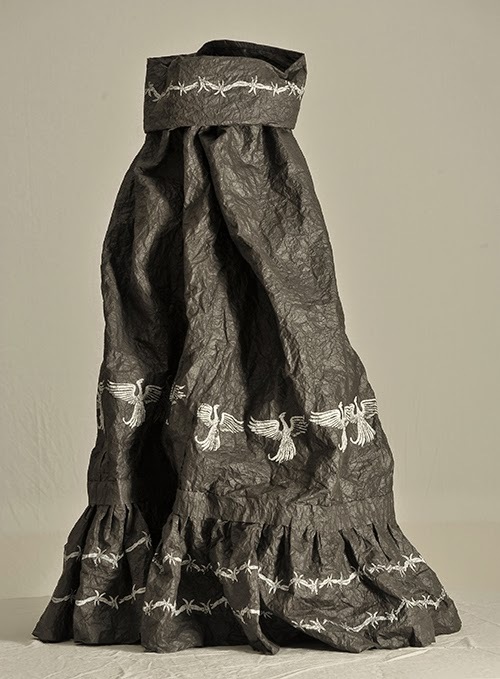 The artists made skirts of paper, barbed wire and fabric detailed with block prints, fragments of text, and photographs. A result of a community arts project, images affixed onto the skirts are referenced in Europe and Canada. Musaj te Dzav was supported by Toronto Arts Council and Ontario Arts Council. The exhibition runs to Sunday April 12. The gallery is open Wednesday – Sunday, 1 – 5 p.m. Contact festival coordinator Nazik Deniz at 416-824-2434 or John Huculiak at 647-669-8882. April 8 was declared International Roma Day at the first World Romani Congress in Orpington UK in 1971. At Opre Roma/Rise Up Roma, Toronto will join international cities in celebrating the artistic achievements, heritage, and pride of the Roma people. Organized by the Roma Community Centre, the festival is a first for Toronto. Most Torontonians do not realize that the Roma settled in the city 100 years ago. The Roma speak a dozen different languages, follow different religions, cook many national cuisines, may or may not follow traditions, and have many different occupations just like members of other ethnic groups. The festival creates a unique cross-cultural exchange improving the public’s understanding of the Roma.